I was drifting off to sleep when I heard someone shouting outside in the car park. Nothing unusual about that. Customers often pitched up in the middle of the night looking for their wallets or keys or wives. I opened my window to see what was going on. The man below didn’t look mad or drunk. He was standing next to his car. The headlights were on and I could see a woman in the passenger seat. ‘Is this where Matthew Mintern lives? Trouble. It was a worrying word but a small one. Trouble does not cover what follows as Cathy Rentzenbrink describes how after a night out with her younger brother Matthew, where she left earlier and he stayed on, he is hit by a car. Cathy arrives not long after to be by his side as the ambulance staff arrive and take him to the hospital, all she can think of is to pray that he survives, pray that he will get better, pray that he will live. Yet in the days, weeks, months and years after his accident pass Matthew, or Matty, shows very little sign of mental (and therefore physical) recovery from the accident and remains in a persistent vegetative state (which is a term I really, really hate and think should be changed for the record) the idea of life becomes less of a blessing and more of a curse. 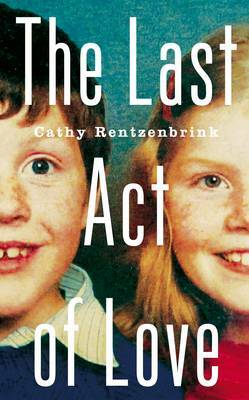 The Last Act of Love follows Cathy and her family as they come to terms with this and the life they all lead alongside Matty afterwards and question what ‘a life’ actually means. There is so much that I admired about The Last Act of Love it is almost impossible not to fawn over it because I think it is such a beautiful, honest and important book. It is utterly heartbreaking, yet strangely hopeful and uplifting too. Cathy manages to build a full picture of relationships and situations in a few paragraphs which give her memoir an extra intensity. For example whilst the accident happens early on Cathy swiftly builds up the wonderful relationship that she had with her brother, who was also clearly her best friend and who she loved without end. Not long after the book opens we are taken with them as they discuss love together while Matty fixes an old motorbike, it is just a few paragraphs yet instantly we see the dynamic and depth of their love, which of course makes what follows all the more heartbreaking and Cathy’s despair and emotions all the more engulfing in the aftermath. Reading was still my friend, though. I read constantly and compulsively, drowning out the sounds of my own thoughts with the noise of other people’s stories. I no longer turned out the light before going to sleep – I had to read until the moment my eyes closed. There could be no gap for the demons to jump into. One of the things that I admired most of all throughout was Cathy’s honesty and directness, both in the good times and the bad. I mention the good times because, as we all know, even in the darkest times there are some very funny (often inappropriately so) moments amongst the sadness. Yet where I think The Last Act of Love excels and is at its most potent and poignant is in the darker moments. The moments where you have to update people on a horrific situation, how you tell people who don’t know (which during Cathy’s reflection on college she gives a list of the options and the likely responses to telling new friends about her brother), the guilt you feel, the spectrum of emotions, the way you think physical pain might take away mental pain, how you cope at points when you feel you simply cannot endure any more and how you do or don’t deal with all these things. It would be very easy for anyone writing something like this to leave out the bad bits, or as in some things I have read simply move all the bad bits around loss, grief and emotional turmoil and project them onto someone else making yourself look the martyr. Cathy doesn’t do that, in fact she often does the opposite. She openly talks about the intense anger and rage you feel, how uncontrollably sorry for yourself you can feel, how hard it can be to support someone who is seriously or terminally ill and indeed be the person who brings up the difficult question of whether someone really should ‘live’ through all of this – which is what makes up the second section of the book. All this before the guilt and grief that follow after someone’s death which she discusses just as honestly. There was no pleasing me. I was angry with people who wanted to ask me about Matty, but also angry when they stopped asking and didn’t want to see him. A tragic accident and a coma are exciting, but the prospect of permanent severe brain damage much less so. People didn’t want to see him. They had loved him – not quite like one of their own, but they had loved him – and it was distressing for them to see him so transformed. They gradually drifted away. Not to make this all about me, though as it is my blog and my reaction to books is always an emotive one as a reader it’s hard not to, but I think all of these aspects of the book were what really chimed with me and also made me think it was ok to have had those dark thoughts and moments before myself. As many of you will know I often looked after Granny Savidge during her terminal illness and had many of these moments. I can remember having blazing rows with her and everyone else in the family because emotions were so high yet loving them all so much. I remember wanting to ignore the phone the third time in the night she wanted help on the commode because I was so, so tired. I can also remember laughing endlessly when she thought a Crunchie bar wrapper was She-Ra’s bustier or when she told me to ‘shove it in your pipe and smoke it’ after I offered her a strawberry. I remember the moments in her last weeks when I felt guilty that I wanted her to die and then the fear when I would say to her ‘you can go now Gran, it’s ok, we don’t mind, we love you’ worrying that she might and it would be all my fault. It was reading Cathy’s story that made me realise that that was all ok, it was grief, it was normal, it was human and it was how I coped even when it wasn’t pleasant under an emotionally crushing time. I hope I haven’t over shared there too much. Speaking of which, before I wrap up, one of the other things that I loved about Cathy’s writing was the fact that while she lets you into some very intimate and personal parts of her life not once does it feel like it is over sharing or exploitative. It is simply a book that is emotionally open and honest and in telling both her story and the story of Matty The Last Act of Love is a book that once read will help or sooth the pain or guilt that anyone who has cared for or lost a loved one feels. Oh the power of reading. If you hadn’t guessed already I would highly recommend people read The Last Act of Love. It is a warm, engaging, emotional yet hopeful book that I think truly is the last act of love from a sister to her little brother. And an act that will provide solace to many, many readers.